← Culturae Mundi is Celebrating Diwali! Binley’s own Stuart Kettell performs yet another innovative stunt to raise money for Macmillan cancer care. Next April, Stuart plans to walk the five-hundred miles of Coventry streets wearing stilts in an epic walk which will take him three weeks to complete. During his eight years of fundraising for Macmillan’s, this has got to be Stuart’s craziest stunt so far. Following his previous fundraising efforts of; cycling from Lands’ End to John O’Groats on a Penny Farthing, Kayaking across the channel from France to Coventry, suspended by balloons and within a Perspex box above Broadgate in Coventry city centre for a week, and finally he ran seven marathons in a hamster wheel in just seven days. As the owner of his own production company, Stuart’s first involvement with Macmillan came through filming their promotional films such as ‘Patience’. Stuart was inspired by their work, and through acquaintances that had been supported by Macmillan, Stuart began ‘training around twice a week’ for extraordinary endeavours in order to raise money for Macmillan. In an attempt to bring the community together, Stuart will make stops at local schools, pubs, and other organisations whilst a tracking device will pin-point his exact position and update his website. Mandy Spraggett, an event fundraiser for Macmillan said that Stuart has raised thirty six thousand pounds which had been “put into a pot and spread over Macmillan to areas and services that need it most.” Due to Stuart’s “wacky” and “totally mad” stunts around 52 cancer and care services in Coventry have benefitted from his support. 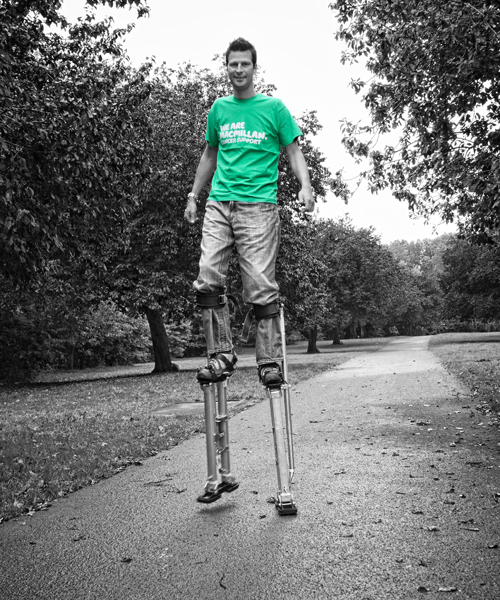 In between working full time, Stuart trains daily in order to build ability and confidence when walking on his stilts. He hopes to extend his stilts to 4ft soon. Not only does Stuart have to learn to balance on the stilts, but navigate the hilly streets of Coventry. Quite a tall order. If you’d like to know more or get involved with Macmillan visit www.macmillan.org.uk/, for Stuart’s website and follow his training for the Stilt walk please visit http://www.willthemadfoolmakeit.co.uk/.